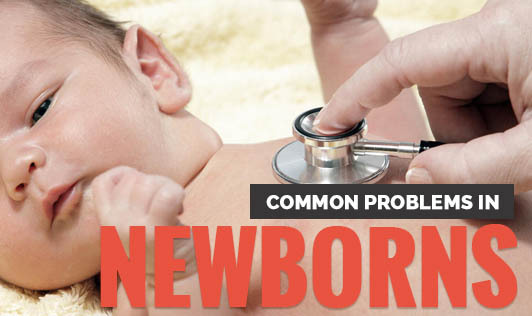 As birth or parenting classes are not conducted in most hospitals, parents are not aware of the common neonatal problems. Due to lack of information, most new parents find themselves running to the doctor at all times. • Swelling: Swelling of the chest may be seen in new born babies. When the chest is pressed, a liquid may ooze out of the mammary glands. Pediatricians caution against pressing the mammary glands as it may lead to infection and abscess formation. This is caused due to hormonal changes in the mother that is transferred to the baby. It reduces by itself by the end of 6-8 weeks after birth. • Watery stools: This is the most common problem infants face. According to pediatricians, the infant takes some time to get adjusted to the mother's milk; also her diet has a direct impact on the breast milk and thereby on the infant. • Sleep pattern: Often, babies sleep during the day and play and feed during the night. This is a normal phenomenon as the baby makes up for the exhaustion by sleeping during the day. • Weight loss: The baby loses about 8-10% of its birth weight in the first 5 days after birth. However, from the 10th day, the baby will start gaining weight again. • Jaundice: Development of jaundice in the first week after birth is common among new born babies. It might require investigation and treatment by the pediatrician. • Breast feeding: It is important to let the mother know how best lactation can be initiated within the first few hours of birth and the right way to feed the baby. Sometimes, the baby might vomit soon after it is breast fed. According to Pediatricians, this is caused when the baby is not made to burp 10mins after it is fed or it is held in the wrong position. Holding the baby in the right lateral position after breast feeding reduces the chances of vomiting. • Bow legs: This is a common phenomenon seen in new born babies which would straighten out with time. • Congenital teeth: Babies have pearl like structures on the palate which goes away with time. If parents are made aware of these common problems before the birth of the baby, panic and worry is reduce to a great extent.